We end the month with a trip south to the Isthmus of Panama. It may look nice and summery, but this is a photo from New Year's Eve 1997. 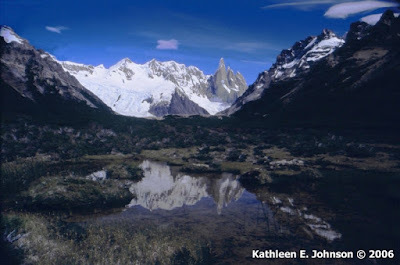 Winter in the mountains of western Panama! 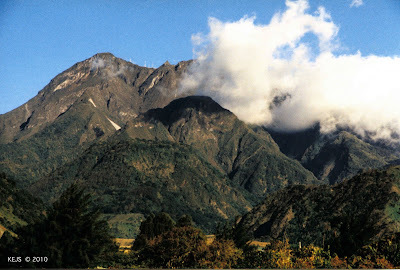 You will see more of Volcan Baru and Western Panama in later postings. 'Best of the Blog' has been posted on my permanent website. Selection were based upon the images that received the most comments. I also did throw in one or two of my personal favorites. 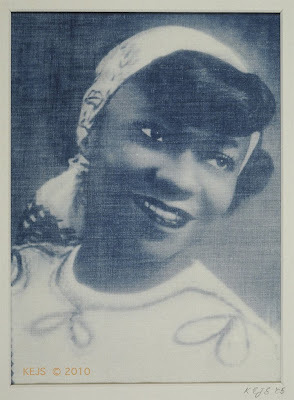 Since Vintage Family Photos proved to be one of the most popular, I add another one here for your consideration: A Cyanotype Redux of Mom, circa 1959. The Family Project involves not only preserving vintage family photos, but also reworking some of the best portraits using Alternative Processes. We'll take a break now from Winter topics. Without fresh snow there is really not much to photograph from a landscape perspective. But before we move on I want a few of you overseas to hear a unique perspective on the winter cold; Posted by Studio M.M.E. Blog: Warm Week in the North. And Now a scene of lush spring green from Eldorado Canyon State Park, along South Boulder Creek. 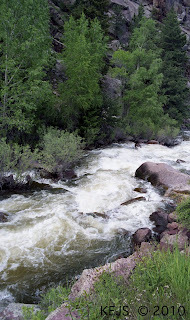 This is during the period of highest flow as the last of the mountain snow melts to supply our summer water. 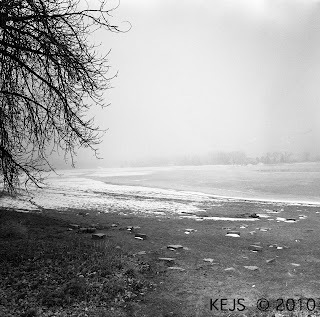 Our Blogger Friend Marius at Light Written Words, has many wonderful fog photos from Romania. They obviously get better Fog than Colorado, but we work with what we find. Our last Winter Photo for a While. 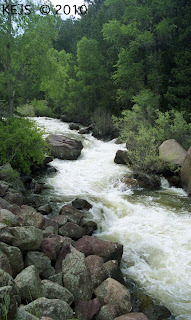 Lets warm up with some Spring and Summer scenes along the Front Range. 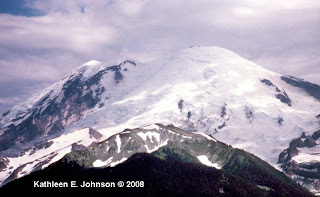 Donald had done some alpine mountaineers training on Mt Ranier and decided not to take up the sport after a month of dodging avalanches and glacial crevasses. 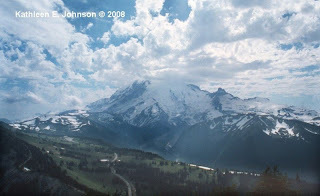 Always covered in snow and glaciers, these are late summer photos. A very still and quit scene from Mt Evans this past summer. 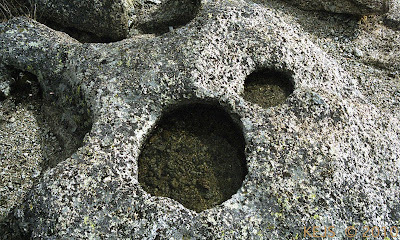 We were primarily there to photograph wildflowers, but the geologist in me took over and I had to capture these perfect geological examples of 'potholes' in the Berthoud Granite. Stillness in the Cascade Range. 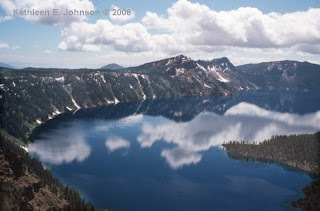 Crater Lake, the remnants of ancestral Mount Mazama which blew its top Krakatau-style nearly 8000 years ago. 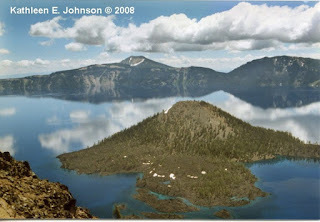 Left you see Wizard island, a new volcano which grew up a few hundred years later from a crater several thousand feet deep. Those of you that have been following the Blog since the summer will know that I tend to post flowers when something has happened that makes me want to pause and reflect. I am always upset when something goes wrong in Haiti because they are so terribly poor. I also feel a certain solidarity because of my own Caribbean connection. But I take from the current tragedy the hope for a real opportunity to rebuild and make a genuinely better life for people there. 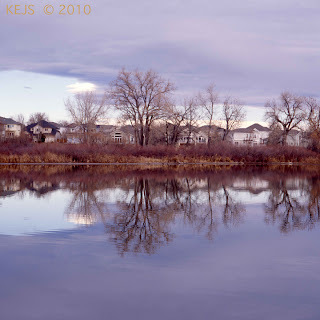 Continuing with the theme of 'Stillness' a view of the Boulder Power Plant on a quiet day yielding a nice reflection. In the Background a glimpse of the Indian Peaks. 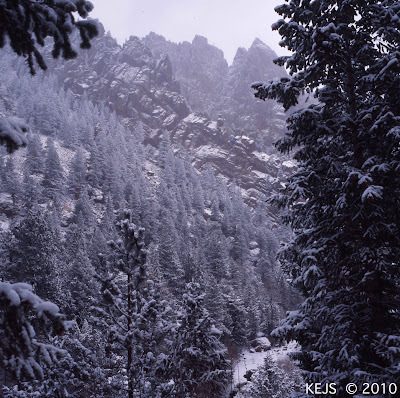 As another winter storm has passed, another view from Eldorado Canyon taken with the Mamiya 6. Let's spend the next few days celebrating the quiet and stillness of winter. 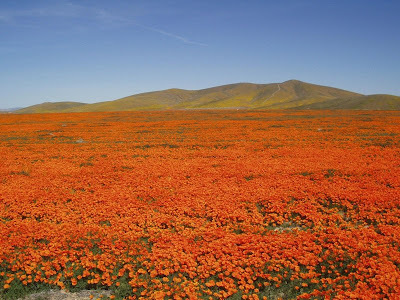 Another Winter-Summer contrast from the Mt Shasta region. 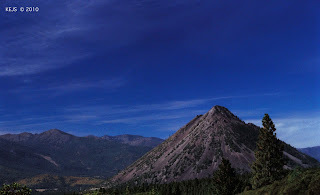 Black Butte is a monogenetic Cinder Cone associated with Mt Shasta, located on it's lower slopes along the road to the ski area. Notice the swirling clouds in the winter view. We had an interesting experience recently trying to photography moving clouds with the D-40. I'll write more about that next week. 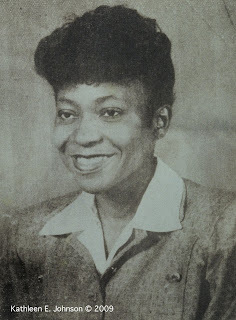 Today is my Mother's 86th Birthday. I call this 'Betty Grable Mom', because of the 1940's upswept hairstyle made famous by Actress Betty Grable (the most Famous American WWII pin-up girl). Van Dyke Contact Print on Canvas. 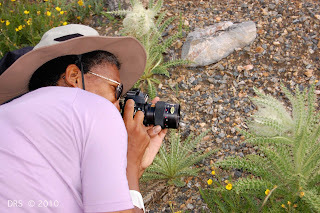 Working on the Alpine Thistle shot for the Calendar. Getting close to my subject. My husband is always taking pictures of me taking pictures. So I've added the subject to my Photo Archives. 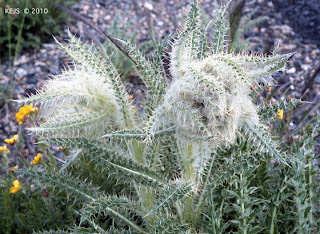 The thistle that I finally selected is shown below. Starting the New Year with a New Series! Welcome to my new series 'The Weekly Volcano'. We shall see if I can keep up the pace, but I plan on posting 52 volcanoes this years, one per week. OK there may be some repeats, because some Volcanoes like today's offering are so photogenic. 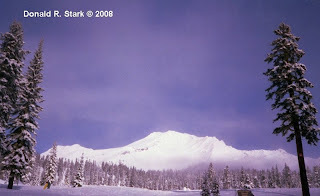 We begin with Mt Shasta in northern California. 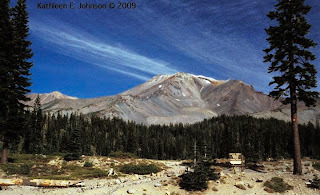 One of California's two active Cascade Volcanoes. This photo was actually taken in January on one of our ski trips. And below, almost the same vista taken in Mid-Summer. 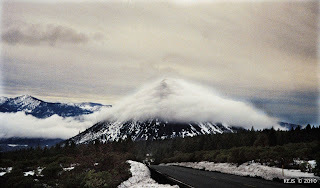 This is not the typical view of Mt Shasta. So we will make a return visit for the classic view later in the series.